A new ad from the Judicial Crisis Network encourages Sen. Lindsey Graham (R., S.C.) to face down Democrats' "bullying" and to continue confirming President Donald Trump's judicial nominees. The ad praises Trump for nominating judges who uphold "the rule of law and the Constitution, just as it was written." It criticizes Senate Democrats for "bullying nominees" and shaming them "just because of their faith." 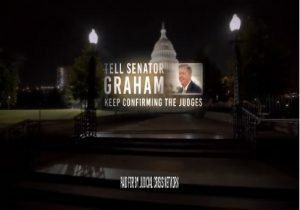 The ad concludes by telling viewers to, "tell Senator Graham, keep standing up to the bullies, keep confirming the judges." Judicial Crisis Network’s Chief Counsel and Policy Director Carrie Severino thanked Graham for his leadership. "Democrats have taken their bullying and obstruction to a new level. Senator Graham has been a strong leader, fighting back, and we want to thank him for that," she said. The ad is part of a $1.5 million campaign that launched Friday night. This ad comes just days after freshman Rep. Ilhan Omar (D., MN) and liberal activists accused Graham of being "compromised" because of how he has become a vocal supporter of Trump.